Have you got to the point where you’re looking for something a little bit different for your next family holiday? Maybe you've ticked the Disney World box, have been to the same villa for the last few years and have dabbled with the all action child friendly beach resort? Maybe you want to get back to the days before children, when you travelled to far flung exotic places? Or maybe you just want your children to experience new cultures and to see the many wonders of the world? This is a question I’m often asked by parents and my answer is simple. Anywhere. Okay, it’s not a case of just setting off with a backpack and a Lonely Planet guide, which you may have done years ago. After all, there are the little ones to think about: health, safety, time zones etc. However, it is possible to travel to exotic locations, see different ways of life and maybe have an adventure along the way. The secret, in my view, is to plan, plan, plan. You want to make the trip as easy as possible and to get the right balance between the cultural stuff (let’s face it we can all get templed out), the fun active stuff and the not doing an awful lot stuff. Take James and Roisin who, with their 3 children (aged 12, 11 and 8), have recently returned from a 2 week trip to China. I worked with them to develop an itinerary that maximised the family’s time, included culture as well as lots of other fun experiences and also got the family off the beaten track. As there’s a lot to see and do in China and much of it involves significant travelling, I arranged every aspect of the trip in advance and there were guides on hand each step of the way. But, despite the structured nature of the trip there was flexibility to change the itinerary as the family went along to suit their mood. The trip started in Beijing. 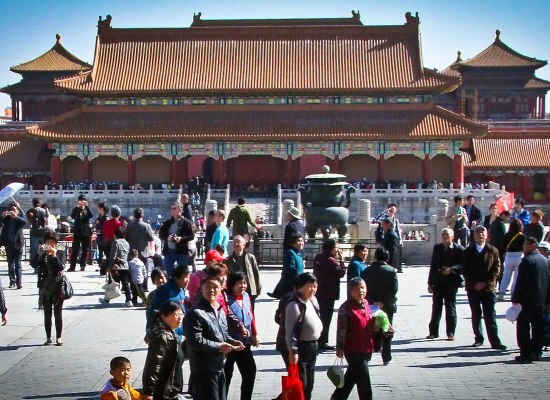 There were the usual cultural sights such as Tiananmen Square, The Forbidden City and The Temple of Heaven, in addition to plenty of time for rickshaw rides around the maze of narrow back streets of the Hutong district, taking tea with the locals and a spot of Kung Fu. Although hordes of tourists flock to the Great Wall of China, I selected a much quieter section for the family to visit which meant that they practically had it to themselves. As the four days in Beijing were quite full on, the family took things at a slower pace over the next few days with a cruise down the Yangtze River. This was then followed by undoubtedly the highlight of the trip, a visit to the Chengdu Panda Research Centre. Here, instead of just visiting for a few hours as most people do, I arranged for the family to spend the afternoon volunteering. They learnt so much about the animals as they helped prepare meals, feed the pandas and clean out their enclosures. They even got a once in a life time opportunity to hold the baby pandas, although they’re actually the size of a 4 year old! Next on the trip were the extraordinary limestone pinnacles of Guilin. Here days were spent rafting down the river, visiting local villages and keeping fit with a private family Tai Chi class. For the final section of the trip, the family got off the beaten track by travelling up into the rice fields of Lonji. After trekking to their hotel on foot, they spent a few days amongst the minority tribes that live there. This was an adventure of a life time and the family came away with some amazing experiences and memories. It also proves that with a well planned itinerary there is no reason why you and your children cannot travel to far flung places. If you’re itching to do something a little bit different for your next family holiday but are not sure where to go, then please contact me and let me inspire you with some great ideas.